Little girls are born to dress up. Whether it is Christmas or any other day of the year, selecting the right dress and the right accessories for your little princess is what every mom loves doing. With all the holiday preparations and errands that you will have to run during this hectic time, we made a selection of the best Christmas Hairstyles For Girls to make life easy for you. No doubt, curls look beautiful on little girls but heating your young one’s hair to make these curls can actually damage their hair a lot. Use kitchen towel which has been cut into long strips to roll strands of hair. Tie a knot and keep these overnight to get the best tight curls ever. This sophisticated hairstyle in our selection of Christmas Hairstyles For Girls can be made by using a doughnut bun-shaper. Just make high ponytail, pull the doughnut over it and style the hair around it. The end result is a very neat and volumized bun. Decorate it with a big, red bow or red threads to make it special for Christmas. We have selected a half-up, half down hair style in our Christmas Hairstyles For Girls list. It is made even more gorgeous with beautiful red baubels, placed at the point where the hair have been pinned together. Pull the hair at the base of the baubels, to create volume on the scalp and make the whole look much more softer. Bow shaped hairstyle has taken the social media by a storm. Everywhere you look, young girls and teenagers are making a splash with this cute style. Make a pony tail and loop it towards the inside. Pull it sideways to form a bow and wrap a hair strand across it as shown in the image. Play with it a bit to make the whole look neater. A simple twist in a regular braid can create a whole new look as is evident from this cute Christmas pleat. Just make a pony tail with the front section of hair. Braid it, as you would normally do, and in the end, pull two strands from both sides to create a bauble look, reminiscent of Christmas. A perfect ribbon braided hairstyle is one of our favorites in this Christmas Hairstyles For Girls selection. Just twist your braid, as you make it, to shape it like a candy cane. Using white and red ribbon will make it look exactly like the colors of our favorite Christmas candy. Although it doesn’t exactly look like a Christmas tree, it does kind of remind us of one. The loops are created by splitting the sections of the braid and pulling the ponytail through that opening. In our Christmas Hairstyles For Girls ideas, we show you how this can be done in two styles; a single braid or even two braids. What is Christmas without elfs? Make pig tails to represent these magical Santa’s helpers and put red and green ribbons through the main braid. This style can also be repeated for Halloween. Elsa is without a doubt the favorite cartoon character of all young girls. Why not try an Elsa single-sided braid look for Christmas? Start making a French braid from one side. Make a regular braid and add hair strands from left and right as you continue downwards. Make sure to go along the side of the scalp and towards the nape of the neck. 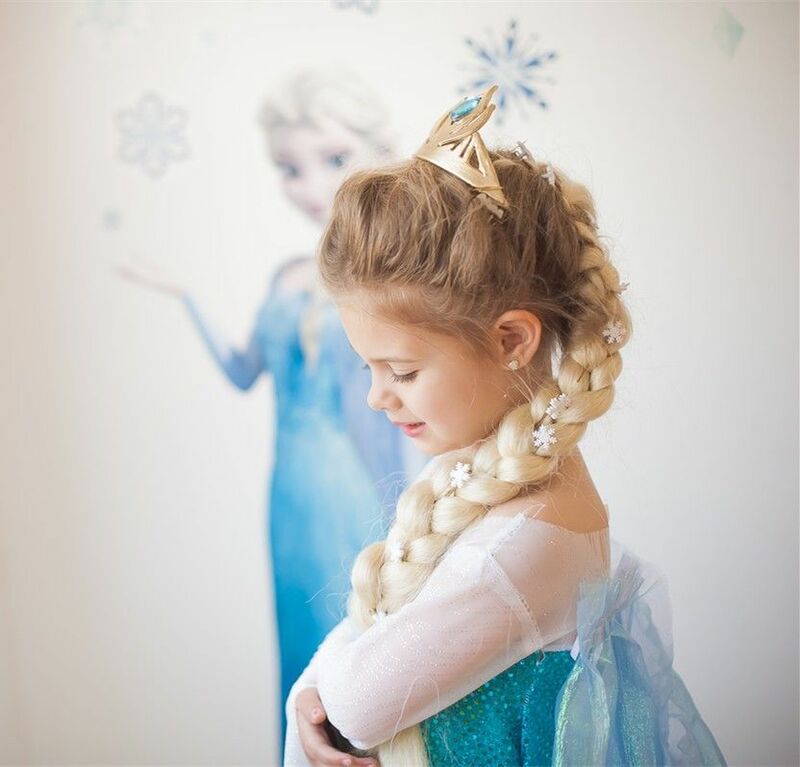 Pull out some flimsy hair strands to complete the “Queen Elsa” look for your young lady. This must be the easiest and most versatile hair looks among the Christmas Hairstyles For Girls looks. Whether your princess’s hair length is short or long, just accessorize with a huge Christmas colored bow to get this festive look. Add a touch of shine and glitter to your festivities by keeping the main hair style simple but add glitter onto selected strands to make it look like shiny hair-lights throughout the length of the hair.You can keep the tinsel same color or if you are really bold go for the all-out multi-color look like the one shown in the image. This is a great DIY idea among our selection of Christmas Hairstyles For Girls. You can either get holly from the ornament section of super stores or make it at home. You can easily find all the things you need to make at home. Just use foam sheets and pipe cleaner to make holly and you are good to go. Add these to a simple low bun to jazz it up for the holiday season. This idea might seem crazy but it actually looks quite cute. Use battery operated LED strands and fix them either on a single pony tail or two pony tails to light your hair up this festive season. Creating a Rudolph on your bun is such a good Christmas Hairstyles For Girls idea. Just make sure that you use a sock or doughnut to create a clean, crisp bun. Insert a red colored pom pom for the nose and use pipe cleaners for Rudolph’s horns. Adding googly eyes will give a funny twist to the whole look. Won’t it be cool to have a Santa, right inside your hair. This hairstyle can be easily assembled by first making a ponytail and then splitting it into two braids. Take a red ribbon and thread it through the braids. Add white pom poms to complete the look. A variation to the santa claus hairstyle, is the christmas tree design. You can use a pull through braid design, already explained in the above sections and place small sized pom poms to get a different style of christmas tree braid shown here. Although this hair syle is most famous for weddings , but it also looks great to depict the snow in the christmas season.This bun reuires a special technique. When you are layering the hair over the dougnut, make sure to twist each strand to give the a flake-like look. Then make a braid of the loose hair and twist it around the bun. A beautiful yet easy design to follow for Christmas Hairstyles For Girls is this Christmas star look. Just side sweep your little girls hair and pin them to a loose bun on the side. 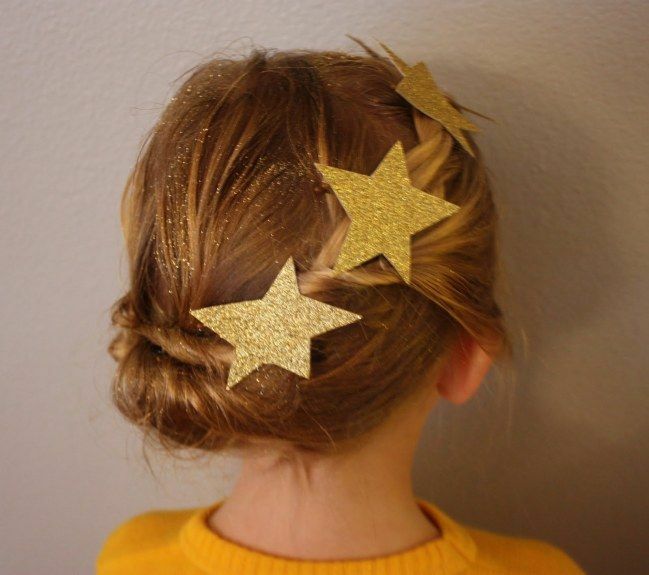 Add stars cut out from foam sheets, to give a beautiful ‘Christmassy’ look to her hair. Twist a regular braid on top of the head in the shape of a wreath and intertwine in it with ribbons and flowers to make it look appropriate for Christmas. Adding silver sparkle to a high ponytail will make it look like you are celebrating the advent of snow for Christmas. Get this awesome look by investing in hair glue to stick this sparkle, so that your hair are not ruined by regular glue. This slightly sophisticated looking bun is not at all difficult to make. Just make use of a ‘hair bump’ to make a low bun and add layers of hair, coming from the front to go over and under this chignon. This is one of the cutest and easiest to make Christmas Hairstyles For Girls. Make two high ponytails and twist each to turn them into pretty little buns. To cater to the taste of the teenage girls, we present this beautiful style in our Christmas Hairstyles For Girls ideas. This sophisticated side bun is created by twisting the side hairs and letting a soft halo of hair fall on the face. A snowman hairstyle is a very fun and carefree style that your little girls will love for Christmas. Make two or three buns or use fake buns to create the body of the snowman and decorate it with pom poms, pipe cleaners and googly eyes to get the full snowman look. We have given you the best ideas for Christmas Hairstyles For Girls. Choose anyone of these according to your taste or dress style and have fun making them. Most of all enjoy your holidays, have beautiful hair and a Merry Christmas.